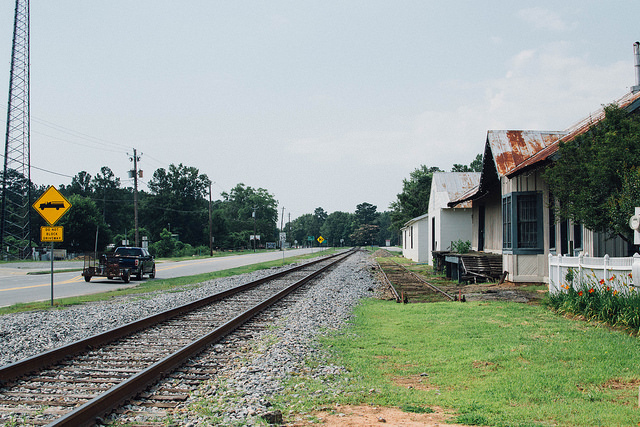 History is a presence in Jones County, an African American South community in middle Georgia (pop. 28,623). Many residents’ ancestors were slaves or slave owners. Civil War battle markers sit on street corners and country back roads. People remember the Ku Klux Klan marching through the county seat of Gray, and black children getting books discarded from white schools with epithets scrawled inside. A watershed moment came in the early 1970s when the county’s public schools integrated; by all accounts, it was a smooth transition. But more than 40 years later, daily life is still tacitly segregated in Jones, where African Americans make up 25 percent of the population. Feelings run deep about the impact of the racial and economic divides and efforts to close them. All the while, educational institutions are seen as a force for progress. And residents here demonstrate how their learning together can build the foundation for community well-being. Jones County’s health factors stand out from the African American South counties overall, the County Health Rankings show. Its median household income is $54,200; the African American South median is $37,500. Similarly, Jones County’s income inequality, defined as ratio of household income at the 80th percentile to income at the 20th percentile, is 4.2 compared with 5.2 for the African American South. Residential segregation between blacks and whites is 31 in Jones, slightly better than the African American South median of 32. Particular challenges emerge in access to care, physical inactivity and obesity. The ratio of population to primary care physicians is 4,750:1 in Jones compared with 2,622:1 for the African American South overall. Jones’s physical inactivity rate of 33% is higher than the African American South rate of 30%. Adult obesity is 32% in Jones; the African American South posts a median of 35%. In general, children in Jones fare better than those in the African American South: 29% are in single-family homes; whereas the median rate in the African American South climbs to 40%. In Jones, children in poverty stands at 19%; the African American South rate reaches 34%. In Jones, 51% of children are eligible for free or reduced lunch; in the African American South, 75% qualify. To bridge the divides between whites and African Americans, a group of pastors of both races meets regularly and discusses sensitive issues, including politics and racial profiling. African American and white churches worship together over holidays. District Nursing and Program Director Anita Barkin and Director of Epidemiology and Assessment Amber Erickson of the North Central Health District, which represents 13 counties in middle Georgia. 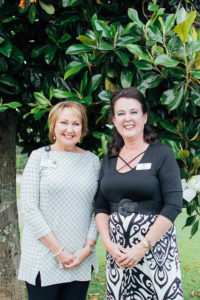 “Jones is one of our shining communities in terms of the [County Health] Rankings,” says Anita Barkin, district nursing and program director of North Central Health District, part of the 13-county region of middle Georgia that works with the local boards of health. On the boards, community members, local government members and a public education system representative identify key community concerns and work with their county’s health department to ensure support for services. 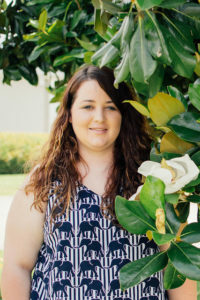 “The nurse manager of [Jones] County Health Department has enjoyed a very strong and positive relationship with local government, with the education system, with other community partners, like Family Connections. And so when you get all of those folks in the room, and they’re all contributing and interested, obviously, you build on each other’s efforts, and you create a positive climate for effecting change,” Barkin says. Work to reduce smoking, obesity, physical inactivity and increase primary care access is ongoing, says North Central Health District’s Director of Epidemiology and Assessment Amber Erickson. A registered dietitian is available for individual consultation and provides outreach education for the counties. Jones County’s health factors contribute to its position in the middle Georgia region. In addition to its higher median household income, the county also has a higher high school graduation rate and more people with college degrees than other counties, Erickson says. “Because of their educational attainment and income levels, they’re able to access care easier than some of our poorer communities,” Erickson says. “The school system is strong, and it attracts young families,” Barkin adds. The Board of Education is the largest employer in the county, and much activity revolves around the school district’s one high school, two middle schools, four elementary schools and a pre-K school. The high school of some 1,500 students and school sports are seen as the great unifiers here. Friday night football is always a crowd pleaser. The next generation is a rallying point for residents at county meetings and online. “If it has to do with our kids, people show up,” says Haley Watson, executive director of the Gray-Jones County Chamber of Commerce. This past summer, the Jones County School System teamed with Jones County Parks & Recreation to feed healthy lunch to children who are food insecure, and provided transportation to and from the two participating elementary schools. The program came about after the school nutrition director studied the statistics of students on free or reduced lunch. They applied for funding from the Seamless Summer Option through the National School Lunch Program — and received it. 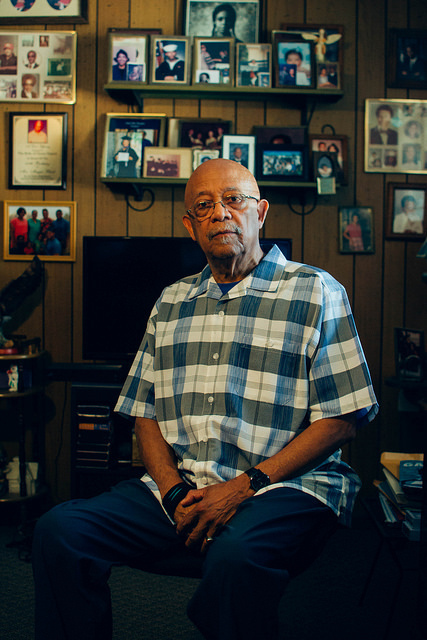 Donald Black, a retired educator, lives in the house where he grew up in Jones County, Georgia. Another example is Operation Early Intervention, a program aimed at keeping children out of the juvenile justice system by engaging the whole family. Donald Black, a retired educator, was a program leader for 12 years after it was created in 1999. Leaders are known to recognize patterns of struggle by keeping a close eye on students who are tardy or absent from school, and perhaps coping with family strife. Lunchroom workers and bus drivers have relayed details about students’ home lives, including leaky roofs and food insecurity. 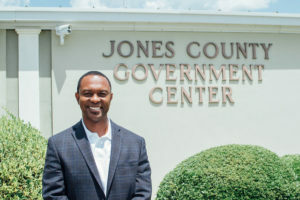 Where neighboring counties’ programs fell away, Jones County’s is still going strong; Black says the community’s close-knit nature and the firm, personal touch of members set Jones apart. “Growing up in a small Southern town, you know everybody….If I don’t know you, I know who you favor. So give me five minutes and I can trace you back,” he says. Listen to Donald Black, a retired educator, share his family’s history and the deep-seated separation between African Americans and whites in Jones County, Georgia. Founded in 1807, Jones County is named after James Jones, a U.S. Congressman from Georgia who died in 1801. Today it’s primarily a bedroom community with about one-fourth composed of national forest under federal ownership. Much of Jones is rural, with pockets of poverty particularly in the southern part. The largest city is Gray (pop. 3,281). 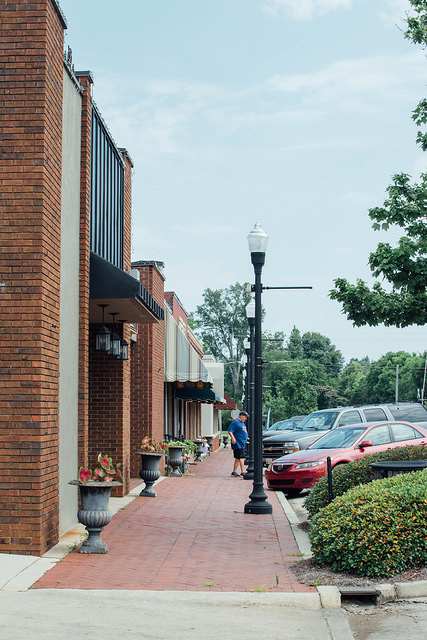 County residents affectionally call it “Grayberry,” a play on Mayberry, the fictional community in the TV sitcom “The Andy Griffith Show.” No Barney Fife here, but the police department comes to check on businesses every night, Watson says. 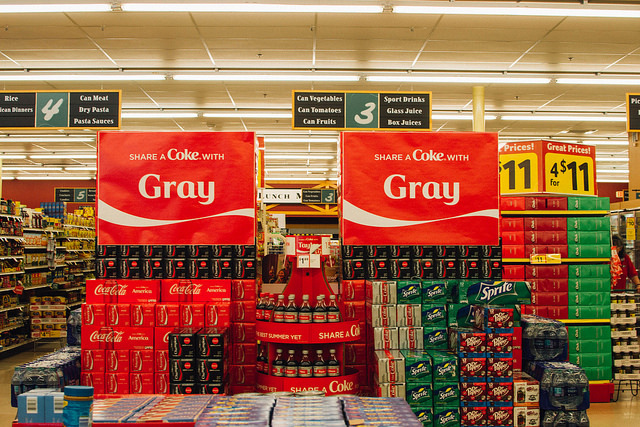 In town, there’s an Ace of Gray; a Walgreens; and two southern-chain supermarkets across the street from one another. 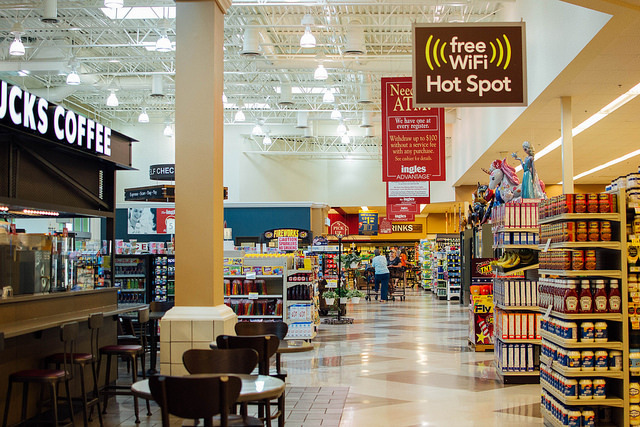 Ingles, housing a Starbucks with seating inside, is the more upscale of the two. On a late spring morning, racial separation was evident: Customers in Ingles were generally white while Harveys shoppers tended to be black. Harveys Supermarket is one of two supermarkets in Gray, Georgia. Railroad tracks flank the edge of the downtown, but no passenger trains run through. Visitors sometimes gather at the musical tribute to Otis Redding of “Sittin’ On the Dock of the Bay” fame, whose family still lives in the county. In close proximity to the marker are the county courthouse, The Jones County News headquarters, a law firm, a hair salon, an antique shop, among other small businesses. Gray, the county seat of Jones County, Georgia, is home to small businesses. Railroad tracks run through Gray, the county seat and largest city of Jones County, Georgia. Of the 12,000 county residents who are employed, 9,000 work outside the county. Commuters typically head in one of a few directions: 20 minutes northeast to college-rich Milledgeville in Baldwin County, 15 minutes south to industry-filled Macon in Bibb County, 45 minutes south to the Robins Air Force Base in Warner Robins, Ga., or an hour and a half north to Atlanta. Haley Watson, Executive Director, Gray-Jones County Chamber of Commerce. Gray-Jones County Chamber of Commerce is working with the Georgia Department of Community Affairs to figure out how to close the economic divide between the area around Gray and the side on the 49 highway that associates with Macon or Milledgeville, Watson says. In Gray, there’s a three-to-five-year plan for mixed-use development, including retail shops and lofts, she adds. County Commissioner Jonathan Pitts admits that economic development in Jones is a continuing challenge. To hold onto graduates and meet future needs, the county has partnered with neighboring Jasper County to open the College and Career Academy in Gray in the 2019-2020 academic year. Its mission is “to create a career pipeline that contributes to the economic development and quality of life in the central Georgia region through innovative academic rigor, technical, and employability skills training.” The Academy is a point of pride — and hope. 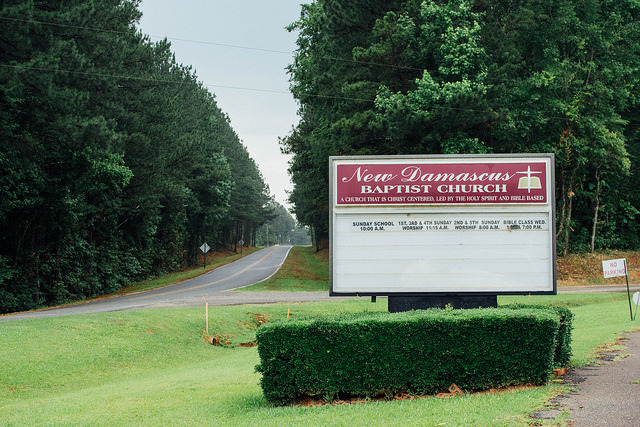 Bridging racial divides is a focus for pastors in Jones County, Georgia. If educational institutions are one pillar of Jones, churches are the other. Churches are where the county’s racial segregation comes clearly into view. Blacks and whites worship separately save for fellowshipping a couple of times a year before Thanksgiving and on Easter. At the same time, about 15 pastors are part of the group PULL, Pastors United in Loving the Lord, where they bring up sensitive issues, like profiling and politics, and try to bridge the racial divide. One of them, Wilbur Greene of New Damascus Baptist Church, shared what happened when both races joined together in choir. “There’s still a degree of unconscious separation because blacks sit with blacks and whites sit with whites… someone in the choir said, ‘Let’s mix up.’” The audience didn’t follow, Greene says. 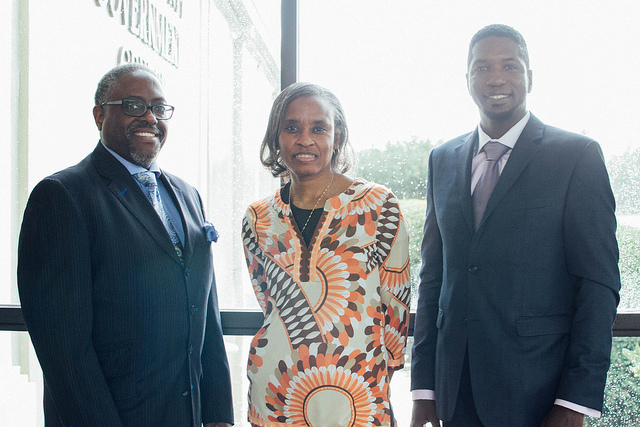 Pastor Wilbur Greene of New Damascus Baptist Church; Cassandra Ridley, a nurse whose father is a pastor; and Pastor Lequint Caswell of Turner Chapel and St. James churches in Jones County, Georgia. Can faith connect the groups? “Government-wise, there’s no rules or regulations or laws or anything that can be set in place that would bridge that gap… We do still have a love for God in common… it gives us an opportunity to at least acknowledge that we have a common place to begin, regardless of our political or social beliefs or practices,” says Pastor Lequint Caswell of Turner Chapel and St. James churches. The three point to the ways people of color feel overlooked in the community. Caswell says he hears from his elderly congregants: “We know what they’re about and how they treat us on a daily basis.” For instance, they don’t have the opportunity to own businesses or sit on the board of trustees of a prominent community bank, Greene and Caswell say. When it comes to health, the pastors describe how intentionally they approach the issue in their congregations. Greene elevates the expertise of nurses in his congregation by giving them time to speak to everyone. Turner Chapel hosts a free health fair on the first Saturday of every month. The church pays a registered nurse to take attendees’ blood pressure, glucose levels and Body Mass Index. She recommends seeing a physician if needed, and keeps a record of her exams, Caswell says. He notes he’s started offering more food options at church gatherings besides fried chicken — and finds baked chicken going faster than fried. Ridley, who is also a nurse, stresses that it’s important to take care of your body. “Faith and health — you can’t divide the two,” she says. 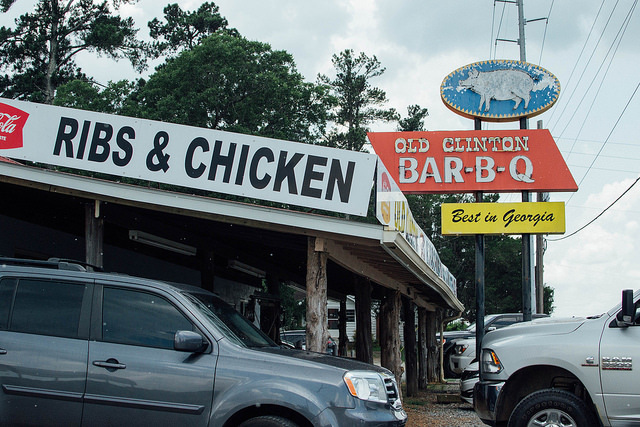 Along the main highway in Jones County, Georgia, Southern-style food is plentiful. Along the main drag — Gray Highway that becomes West Clinton St. — sit Southern-style restaurants: Old Clinton BBQ House, 107 Smokehouse and Chevy’s Pizza. The Dairy Queen, with its outdoor seating, draws people from neighboring counties. County Commissioner Jonathan Pitts is the brainchild and steward of the county’s Live Healthy Jones initiative on healthy eating and living. While these Southern foods are deeply ingrained in the culture, the community is trying to instill new habits. Besides the district’s dietitian, a partnership with the 4-H extension agency teaches children how to prepare healthy meals for their families for $20. It’s part of the Live Healthy Jones initiative to promote healthy living, which Commissioner Pitts spearheaded three years ago after attending a conference by the National Association of Counties. Other Live Healthy Jones partners include Jones County Family Connection, Community Health Care Systems, Jones County Parks & Recreation and Jones County School System’s nutrition director. In collaboration with Community Health Care Systems, the county had a health fair in Haddock, a rural town in Jones, with a mobile medical unit and provided physicals to 20 people. They’ve partnered with the school district on its summer feeding program and a back-to-school drive. Monthly posts on Facebook promote wellness initiatives at area hospitals outside the county. Although Live Healthy Jones hasn’t been a sustained effort, it has brought key people to the table, forged relationships and made new projects possible, Barkin says. Meanwhile, Jones County’s nurse practitioner is booked every week for contraception, hypertension and diabetes services, Barkin says. “It has a lot to do with sharing that these services are available and being a welcoming staff.” Sometimes people with health challenges can’t make it in because transportation access is uneven in the county’s rural parts. 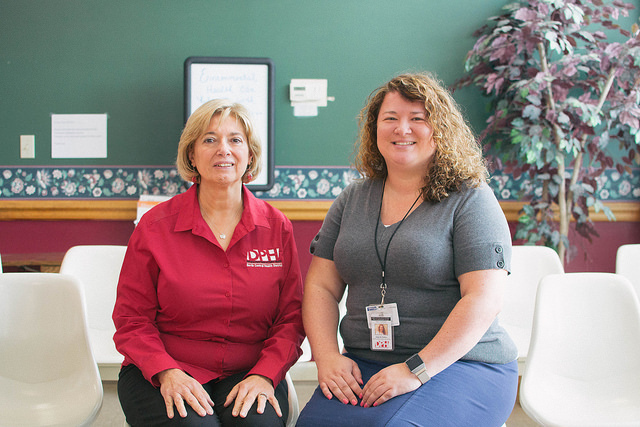 Kay Lawrence, Director of Marketing and Outreach, Community Health Care Systems with Joy Carr, Coordinator, Jones County Family Connection. 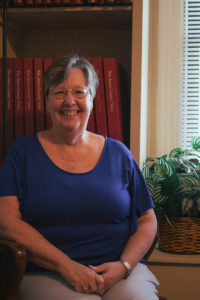 Addressing mental health is a regular collaborative practice, says Joy Carr, coordinator of Jones County Family Connection. The health department, mental health providers and the school system gather every month to consider children and families with mental health issues. Referrals typically come from the school or the court system. Licensed therapists practice in two schools. An option for residents without any health insurance is Community Health Care Systems, which set up in Jones about five years ago. “Our greatest concern is that everyone has access to healthcare, regardless of their ability to pay,” says Kay Lawrence, director of marketing and outreach. Located in Gray, it houses family medicine; an OBGYN; a therapist; the county’s only pediatrician, and offers free school physicals. Referrals often come from the school system. The office has expanded as Family Connection has made residents aware of its existence. Data helps community leaders zero in on parts of the county in the most need. 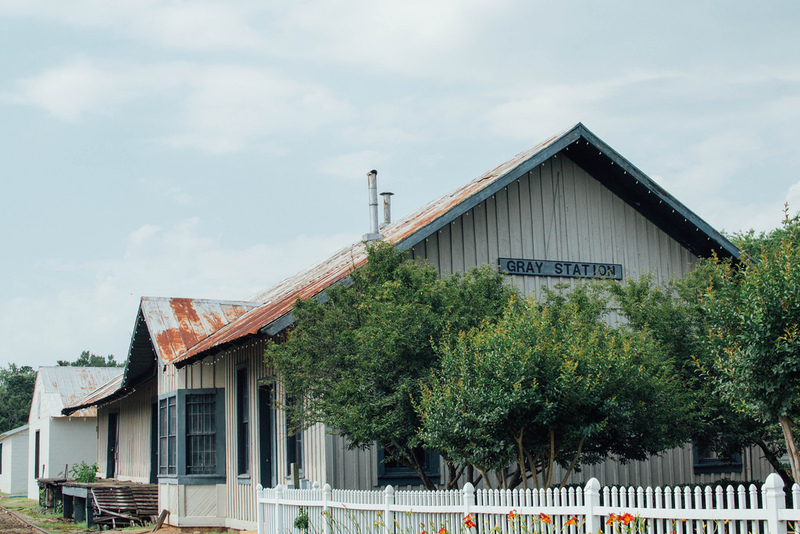 Georgia Family Connection Partnership created a tool that looks at nine specific indicators in each census tract in Jones County. In one case, the team realized that a low number of children in the south end of the county did not have health insurance. Family Connection collaborated with the insurance registration representative to determine whether people qualified for state or federal coverage and helped people register. “We saw our numbers shoot up significantly in the number of children with healthcare coverage,” says Carr. Debbie Lurie-Smith, Managing Editor, The Jones County News. The broker suggested a wellness program as an answer.